In poetic form, Lyon tells the story of a young girl, Sharonda, and her mother who have a Habitat for Humanity house built for them. The story moves from them living in a tiny room together in her Aunt Janey’s apartment and through the process of the home being built and completed. Beginning with the empty lot and hope, the story is built as sturdily and lovingly as the home itself. Lyon’s poetry does not rhyme and for most children will not read as a poem, but it is. Filled with imagery, captured moments and truth it is a powerful message of community. Anderson’s illustrations add so much to this book. They too are real, concrete and yet elevated. Her paintings have unique perspectives, strong emotions and great composition that allow for deep colors. A beautiful picture book that really speaks to the power of hope, community, and family. Appropriate for ages 4-8. 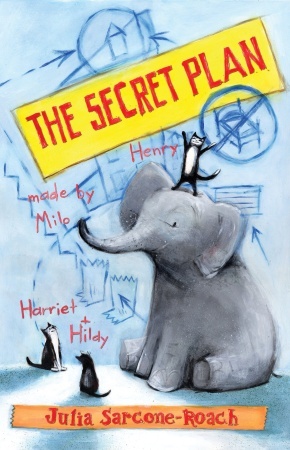 Four friends, Milo, Hildy, Henry and Harriet are always being interrupted by bedtime! So they hatch a cunning plan to get to stay up later. Of course, their first few plans don’t work as well as they had hoped as their parents discover them hiding around the house, see through their disguises, and not even sneaking out works. In their final plan, they pretend to be getting ready for bed as usual, then Milo the elephant dons his big furry monster slippers to sneak up the stairs. They head to the attic where they find costumes, books, and snacks. Eventually they start to get sleepy and head back down to bed. This is such a winning book. The four main characters are real scamps and their plans and the outcomes are deliciously naughty and very funny. I especially appreciated Milo blending in with the wallpaper by painting stripes on himself. Their disguise is equally funny with all of them working together. But it is the ending of the book that really makes it work. Instead of getting into any trouble in their late night escapade, they have a quiet time with books and a tea party in the attic. There is no parental outrage, no repercussions, just the immense pleasure of a late night with friends. Sarcone-Roach’s art works very well here. Done in acrylic paint, the illustrations are rich, vivid and engaging. A lot of the humor here is visual, though the wry tone of voice of the text offers some of the laughs. The house that the animals share is wonderfully tippy and upright, filled with stairs. A great book to share for a bedtime story or a special late night read. Appropriate for ages 3-6. I seem to be posting a lot about films these past couple of days, but by far the most puzzling to me is the announcement of an upcoming film based on The Berenstain Bears! The film will be done by Walden Media with Shawn Levy producing. They will be a mix of live-action and computer animation. That’s the part I find puzzling. Why not do entirely computer animation? Levy compared his vision of the film to the tone of Will Ferrell‘s Elf, which had a sweet, earnest hero who clashed with his cynical surroundings. “I think the movie will be witty but never sarcastic,” he says. So will the Bear family be the only bears? Is it a human world? Because that is an inherent change from the series where everyone surrounding the Bear family were also bears. Golly, this one has me bewildered. Luckily I am not a die-hard fan of the books because I find them far too honey sweet for my liking.